Some love to over the top in their Christmas decor, while some prefer to keep it subtle. If you're planning out your decor scheme for this holiday season, have a look at these 2017 holiday decor trends, embracing the designs and aesthetics of the moment! It seems that the DIY and eco-friendly consumer mindsets influence homes more and more each year. 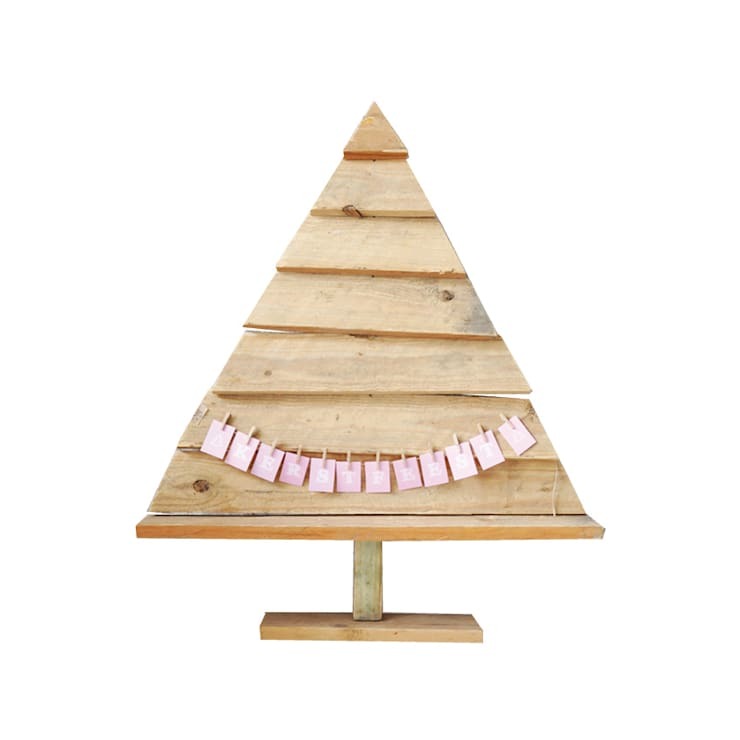 This year, consider crafting your own Christmas tree from recycled household materials or salvaged construction materials. 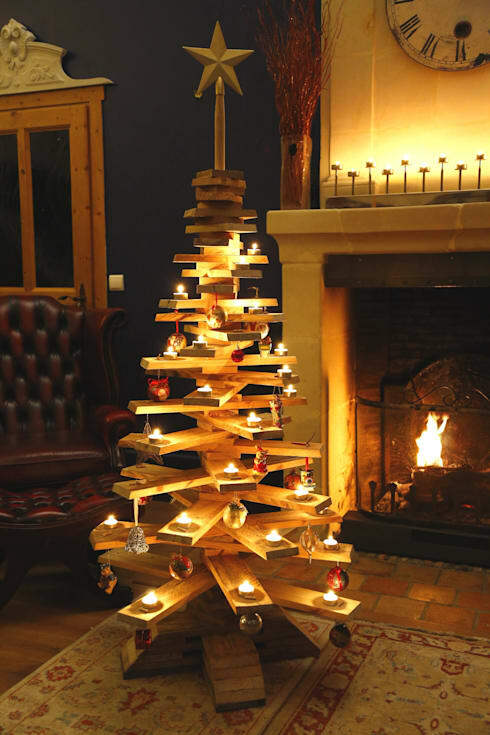 This popular style is a simple design made from boards nailed together in the center, providing convenient shelves for little tea light candles to rest. It's becoming more and more common to let the real trees stay in the ground, using creativity and resourcefulness to create your own unique interpretation of a Christmas tree. Any interior designer will tell you: it's amazing what a quick coat of paint can do! It seems that this year's obsession with painting old, junky furniture in order to create that vintage nouveau atmosphere has taken hold in holiday decor as well. 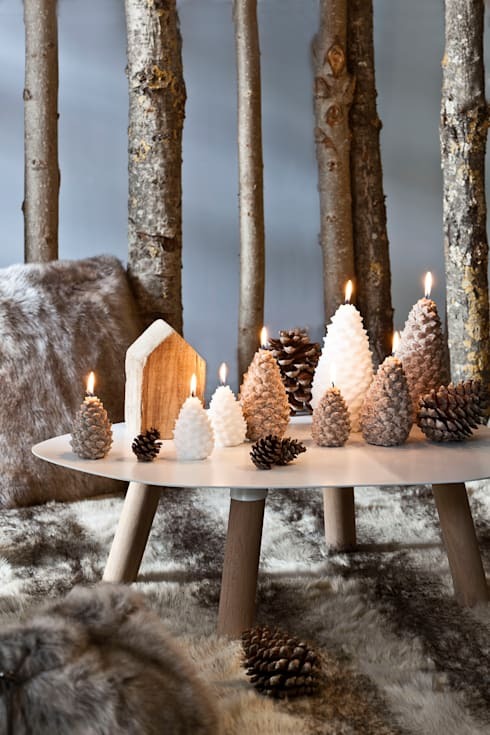 Incorporating natural winter elements like pinecones, slices of wood, and holly wreathes is always beautiful, but you can personalize this natural decor by painting them with craft paint to display a certain colour scheme. Metallics, neutral and soft palettes, and glittery paints are especially stylish choices. Traditional Christmas decor includes statues of angels, imagery of snowflakes and snowmen, familiar depiction of Santa Claus and his elves, etc. This year, holiday trends are turning away from these literal representation of Christmas figures and opting for more abstracted decor. This branch is an excellent example of this, with three dimensional geometrical shapes taking the place of leaves, or perhaps falling snowflakes, colourful Christmas tree ornaments, or hanging berries. Geometrical interpretations like this one are especially popular in home decor designs this year, as they still create a festive, decorative atmosphere without feeling gaudy. This is an especially great choice for families who will be hosting holiday gatherings that include people from different belief systems – abstract and artistic interpretations of holiday themes are perfect for setting a neutral and open-minded holiday atmosphere. Rough textures and raw edges were highly popular last year, and they continue to win the hearts of many this year as well. DIY projects that recycle wooden pallets have practically become mainstream, and there are thousands of tutorials with ideas for repurposing old wooden furniture, wicker baskets, wooden crates, and other raw, natural materials. The unfinished, rustic nature of these items brings a a down-to-Earth, old-fashioned feel to your space, providing a nostalgic link to the simpler times of the past. Light is a highly important element for creating a warm and cozy atmosphere in your house. It's one thing to add garlands and ornaments, but adding a warm glow to the room can completely change the atmosphere on a fundamental level. Consider adding another lamp to your gathering spaces, or even hanging a sparkling chandelier from the ceiling. 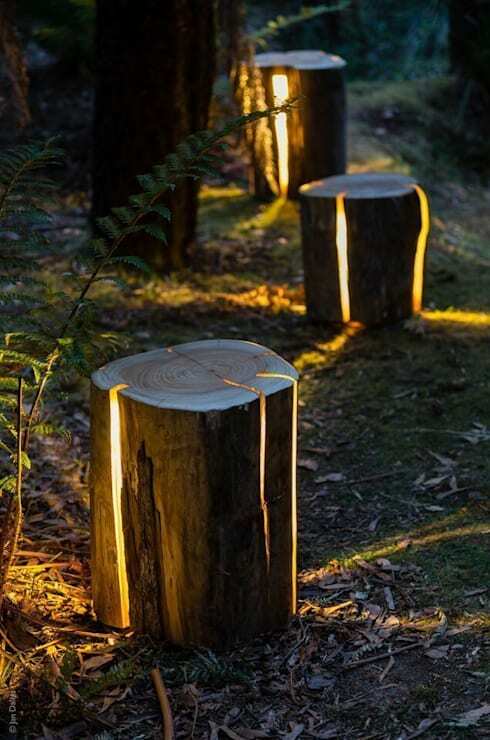 These backyard tree trunk lamps are a new trend this year, and aside from being a great addition to the campfire, they could create a glowing ambience in a living room as well! If you're upgrading your Christmas lights, consider investing in LEDs. They cost more upfront, but they use less energy, give off a brighter light, and burn at a lower temperature (meaning there's less risk of fire than incandescent bulbs as they come into contact with dry pine needles). 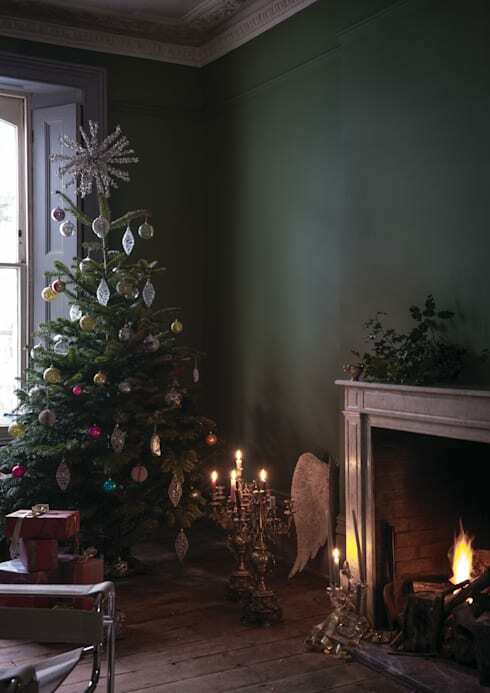 This year, holiday tree decorations point towards extremes: schemes that are either minimalist and uniform or, in contrast, highly varied and eclectic, have come into play. This example shows a funky mix-and-match tree with ornaments that differ in shape, material, colour, and style, making for an energetic blend. The assortment of props like a candelabra and feathered angel wings also contribute to this eclectic fusion of styles. There's no better time than the holidays for reveling in a sense of abundance. Decor schemes that look well-furnished and filled out have a special place in the homes of many this season. This living room scene creates a sense of abundance and luxury with a light pastel palette that draws the room together into one, with soft textures in the woven blanket and upholstered chair and a heavily frosted tree overflowing with ribbons and ornaments. 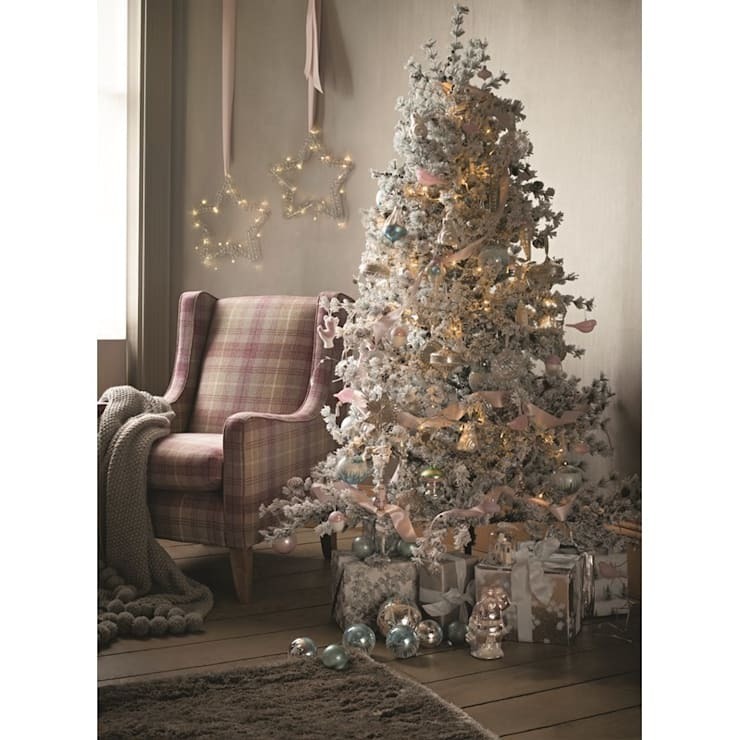 The placement of a few extra bulbs on the ground creates an additional feeling of abundance, as there seem to be so many ornaments that they're beginning to pile up! It's fun to try something new by jumping on the latest trends, but it's important to mention that some things never go out of style. As holidays are a time to honour a sense of connection to family and tradition, some of the greatest designs are the time-tested, traditional ones. Here's a cute felt Christmas tree craft made from recycled felt – a nod to a typical holiday image while still keeping with the eco-friendly times. 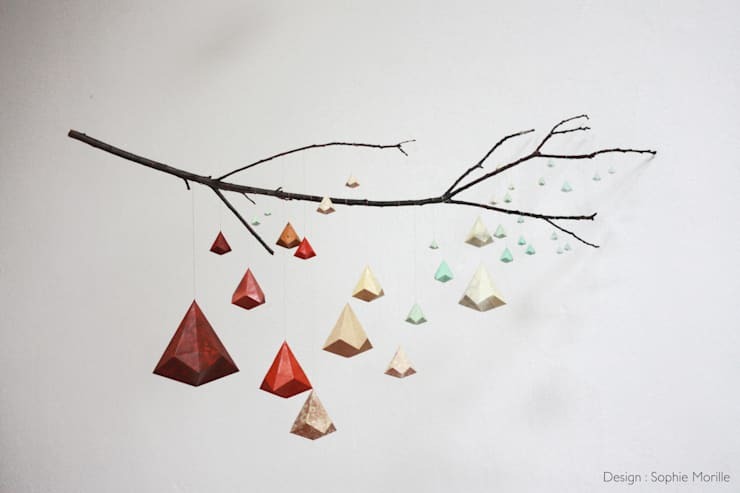 What do you think of this holiday decor inspiration? Comment below!